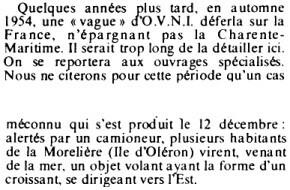 Reference number for this case: 12-Dec-54-La Morelière. Thank you for including this reference number in any correspondence with me regarding this case. 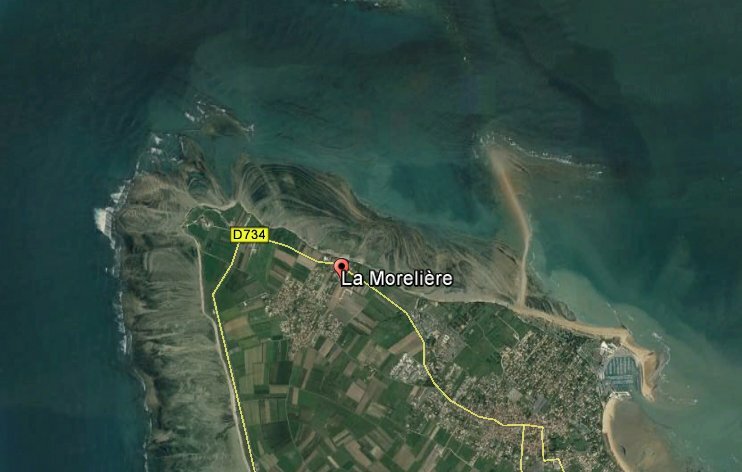 Alerted by a truck-driver, several residents of La Morelière, on the Island of Oléron, saw coming from the sea, a flying object having the shape of a crescent, moving towards the East. A few years later, in autumn 1954, a "flap" of U.F.O. broke on France, not sparing the Charente-Maritime. It would be too long to detail it here. One will refer to the specialized books. We will cite for this period only one ignored case which occurred on December 12: alerted by a truck-driver, several residents of La Morelière (Island of Oléron) saw, coming from the sea, a flying object having the shape of a crescent, moving towards the East. Possible plane, meteor, moon, low strangeness. "La Morelière" on the Island of Oléron, is a beach, and a street, towards the northern point of the island not far from the Chassiron lighthouse at the West of this place. The object moving towards the East was thus going in the direction of the land. Since af "crescent" shape is reported, let me specify that the Moon at8 p.m. was at azimuth 60° still under the horizon. It will rise at 08:21 p.m. in the North-North-East and will pass to the meridian line at 02:57 a.m.. It was in increasing gibbous phase, 89.7 % of its surface is lighted. [no1] "J'ai effectué ma propre enquête sur les O.V.N.I. en Charente-Maritime", article in the sensationalist magazine Nostradamus ("Nostra"), by "M.J.M.F. ", France, #133, October 24, 1974. 1.0 Patrick Gross October 19, 2011 Création, [no1]. 1.1 Patrick Gross December 1, 2016 Addition of the Summary. Explanations changed, were "Possible plane, meteor, moon" so far.